It can quickly analyze the input and output status of Arithmetical Logic Circuit according to the Special Bus Module, ARITHMETICAL LOGIC Gate of Zeroplus Technology, including Adder, Subtracter, Multiplier, Divider and the corresponding input and output of BCD decoding. It is suitable for the development test of Arithmetical logic or study. Digital logic module, which is one kind of modules of Zeroplus Logic Analyzer, can analyze the input/output of digital logic gate circuit. Considering there are many kinds of digital logic gates, nowadays we only develop seven kinds, such as AND, OR, NAND, NOR, XOR, XNOR and NOT. 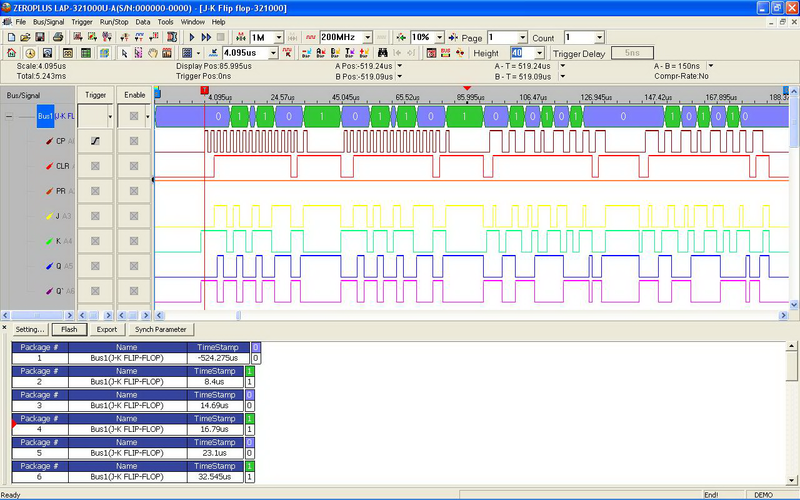 Zeroplus Logic Analyzer supports the function of analyzing Protocol Analyzer JK FLIP-FLOP, which is usually called JK FLIP-FLOP. It is the basic circuit in the field of the electronic circuit and is used for the practice theme in school’s exercitation classes. Zeroplus Logic Analyzer supports the function of analyzing Protocol Analyzer UP DOWN COUNTER Analysis Module. UP DOWN COUNTER is a widely used timing circuit in the digital system. It is mainly used in Counting, Frequency Division, Timing and Clock Generator Circuit.